Due to these efforts, WCLT has acquired over 173 acres of land in Westborough. Why should you consider giving or selling land to the Westborough Community Land Trust? If you would like to talk about planning for the future of your land, please contact the Chair of the Land Preservation Committee or WCLT President. We will be happy to help you plan for the future. WCLT is a nonprofit organization created to protect essential open spaces and to help preserve open lands for future generations. The membership of WCLT is made up of some 400 individuals and families. We have a board of directors made up of talented individuals who share a commitment to the preservation and care of the town's natural resources. We are committed to caring for the land we have in our trust. What does WCLT do with the land? Under our care, our properties stay pretty much the same as they were. We enhance the property with trails and clean up trash and invasive species. Permitted activities on our lands are typically walking, hiking, walking dogs on leashes or under owner's control, ice skating, fishing, and other passive recreational uses. Prohibited uses are operating motorized vehicles, hunting, cutting trees and vegetation, littering, dumping, and anything that would harm the natural condition of the land. WCLT will manage the property, post the property, develop and maintain trails, monitor the land for problems, and take responsibility for clean-up and dealing with unwanted activities. Why should you consider giving WCLT a conservation restriction on your land? A conservation restriction (CR) is a partial interest in your property given to WCLT to limit development or other damage to natural resources. The private owner retains title to the land. Because the CR reduces the land's market value, the owner is often eligible for reductions in property, estate, or income taxes. A conservation restriction works as follows: When a landowner gives a conservation restriction on a property to WCLT, he or she gives up certain rights to the land but retains ownership. The rights relinquished are usually those to subdivide and develop the land. The owner typically retains the right to sell the property or transfer it to heirs and to use the land for recreation, farming, or forestry. Public access to the restricted land is an option that need not be granted. Each conservation restriction is unique, however, and will reflect the needs of the owner, the characteristics of the land, and the interests of WCLT. For example, the owner may want to reserve the right to build a limited number of houses, perhaps for family members, on a specific part of the property. Fundamentally, landowner and WCLT share an interest in protecting the public benefits of a specific habitat, trail corridor, piece of shoreline, or scenic view. Why should you consider granting WCLT a trail easement on your land? WCLT is leading the effort to build the Westborough Charm Bracelet Trail network. The long-term goal is a network of trails connecting the neighborhoods of the town. If you have a piece of property with either existing trails or the potential for trails, please consider granting a trail easement to WCLT. One common concern on trail easements is liability. 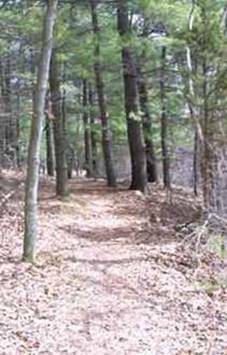 Massachusetts General Laws, Chapter 21, Section 17C, the Recreational Use Statute, protects landowners from liability for trails on their property if the trails are open to the public. WCLT maintains additional stewardship insurance to protect its trail maintainers. WCLT will take over the maintenance and development of the trails. We will work with the landowner and the neighborhood to educate trail users and take care of any problems that might occur from people crossing your land. Developed by the UMass Extension's Forest Conservation Program, Masswoods.net is an invaluable resource for landowners making decisions about the future of their land. If you are a landowner or a member of a homeowners' association, contact the WCLT Land Preservation Committee Chairman Don Burn for information on how WCLT can work with you to protect your land.